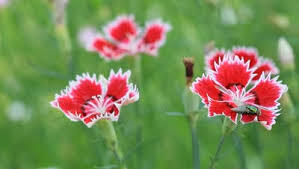 When I was a very young child, I used to go to my mother’s carnation garden and try to open up all the budding flowers. At first I thought I could speed things along – get the buds fully open and beautiful so my mother could enjoy them sooner. Even after my mother patiently and, what I can see now was the exercising of loving-mother restraint, repeatedly explained to me that I was not helping but was in fact destroying the flowers and they would never bloom, I persisted in trying to open the buds. I knew my mother said it was wrong to do. I knew she said it wouldn’t work and that it upset her, but I was pretty sure that the laws of nature didn’t apply to me. Don’t we all think that sometimes? You just have to give some things the time they need: to grow, to heal, to open, to close, to develop, to rise or recede. You can’t help every process along. What you can do is get out of the way and give time time.